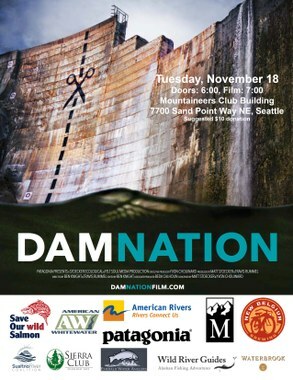 On November 18, salmon and river advocates are bringing the award-winning film, DamNation, back to Seattle screens to raise awareness about the plight of the Snake River salmon. DamNation tells the story of the 20th century dam building boom in the Lower 48, and explores the growing effort to remove dams and the growing awareness that America’s future is bound to the life and health of free-flowing rivers. Ultimately, the film is about hope, resilience and action. DamNation has received acclaim across the country, including the Audience Choice Award at its premiere at the SXSW Festival. The momentum from successful dam removal projects on the Elwha and White Salmon rivers has highlighted opportunities for more river restorations, specifically on the lower Snake River in eastern Washington. Removing four dams on the Lower Snake can restore a river and its endangered wild salmon, reconnect communities and breathe new life into communities along the lower Snake River and its tributaries. Please join us for a wild salmon reception and a screening of the award-winning film, DamNation. Learn more about the lower Snake River and its one-of-a-kind salmon, what’s at stake and how you can help. Beer provided by New Belgium Brewing. Take action to win prizes from Patagonia, DamNation and more. This event is free, but there is a $10 suggested donation at the door. RSVP's are strongly encouraged in advance. An expert panel discussion will follow the film featuring: David Montgomery, a MacArthur Genius Award Winner, University of Washington professor and author; Jim Waddell, a retired Army Corps of Engineers project manager; Tom O’Keefe, the Northwest Regional Director of American Whitewater; and Mike Wood, the executive director of the Susitna River Coalition. Presented by event partners The Mountaineers, American Rivers, American Whitewater, The Sierra Club, Save Our Wild Salmon, Susitna River Coalition, Patagonia, New Belgium Brewing, Waterbrook Winery, Emerald Water Anglers and Wild River Fishing Guides.